What Is Marine-D3 and does it live up to anti-aging claims? 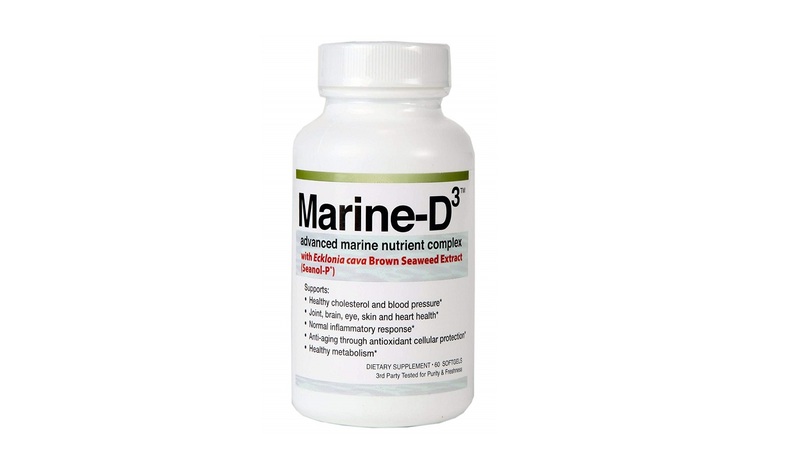 Marine-D3 (by Marine Essentials) is promoted on the company's website as a "super-pill" designed to "stop accelerated aging [in] its tracks" and "help lower and restore your blood pressure levels." The website also claims that "By giving your cells what they need your body will experience energy." However, no clinical studies have been published to back up these claims specifically for the Marine-D3 formula. The recommended daily serving (2 capsules) of Marine-D3 claims to provide 1,000 IU of vitamin D3, 100 mg of EPA and 200 mg of DHA (plus 40 mg of other omega-3 fatty acids) from calamari oil (Calamarine®), and 40 mg of an extract from brown seaweed (Seanol-P®). Each capsule costs 83 cents ($1.67 daily) based on purchasing a 60-capsule bottle for $49.95 on Amazon (it costs more -- $67 — if purchased on Marine Essential's website), so a suggested daily dose of 2 to 4 capsules would cost $1.66 to $3.32). ConsumerLab.com has not tested this product to determine the amounts and quality of the claimed ingredients. Assuming it delivers what it claims, however, a daily dose of two capsules would provide 1,000 IU of vitamin D3, which is more than most people need (the recommended daily intake is 800 IU for adults ages 70 and older, but 600 IU for younger adults). Doubling the dosage, as suggested as an option in the directions for use, would provide 2,000 IU, which could be appropriate for someone slightly deficient in vitamin D and could, for such a person, have a variety of benefits. (See How Much Do You Need and How Much Is Too Much? in the Vitamin D Supplements Review for more about choosing the right dose of vitamin D). The 300 mg of EPA and DHA from calamari oil claimed in two capsules of Marine-D3 is in line with suggested average daily intakes of these omega-3 fatty acids from US Dietary Guidelines and the American Heart Association to reduce cardiovascular risks. However, this benefit is only associated with intake of these omega-3s directly from consuming fish; studies have not found fish oil supplements to reduce the risk of cardiovascular death. Fish oil supplementation may have other benefits, such as improving age-related cognitive decline, anxiety, and depression, but typically at higher doses than provided in Marine-D3 (see the What It Does section of the Fish Oil and Omega-3 Fatty Acids Supplements Review for more information). The third ingredient in Marine-D3 is an extract of brown seaweed (a type of algae known as Ecklonia cava) called Seanol-P. Many of Marine-D3's claims appear to relate to this ingredient. The extract has anti-oxidant effects and, according to its manufacturer, BotaMedi, has been authorized by the FDA for use as a dietary ingredient. A 12-week double-blind, randomized clinical trial among 97 overweight men and women in Korea showed that a daily dose of 144 mg of this extract led to significant improvements in body weight, BMI, body fat ratio, and waist circumference compared to placebo -- although this comparative benefit was not found for those receiving a lower dose of 72 mg. However, both low- and high-dose groups showed significant reductions in total cholesterol and LDL cholesterol and increases in HDL ("good") cholesterol compared to people receiving placebo, with total cholesterol falling by 14.6 and 18.8 mg/dL in the low- and high-dose groups, respectively (Shin, Phytother Res 2012). The amount of Seanol-P in two capsules of Marine-D3 (40 mg) is about half the lower dose used in this study, suggesting that Marine-D3 may not reduce body fat but, if a double dosage is taken (four softgels) it may improve cholesterol levels. Despite the fact that laboratory and animal studies suggest Ecklonia cava may have a blood-pressure lowering effect (Hong, Korean J Pharmacogn 2006; Wijesinghe, Nutr Res Pract 2011), in the study above, there was no significant decrease in blood pressure compared to placebo. There do not appear to be any studies on the effects of Seanol-P in people diagnosed with hypertension. As for Marine-D's claim that it increases energy, one randomized, placebo-controlled study found that young men drinking a Ecklonia cava preparation before high intensity exercise had an increased time-to-exhaustion -- an extra 2 minutes (Oh, Int J Sport Nutr Exerc Metab 2010). This may suggest a benefit for exercise endurance, but more studies are needed. From a cost perspective, you can get the vitamin D3 and omega-3 fatty acids in Marine-D3 from individual supplements at much lower cost than the $1.67 per day cost of Marine-D3. Choosing the best priced, quality-Approved supplements tested by ConsumerLab.com, you can get 1,000 to 2,000 IU of vitamin D3 for as little as 2 cents from liquid drops or softgels, and you can get 300 mg of EPA and DHA from calamari oil for 30 cents (or from fish oil for just 3 cents). The bulk of what you are paying for in Marine-D3 is Seanol-P. Seanol is available in several other marketed supplements, although these products use what is called Seanol-F, which is apparently a less concentrated ingredient than Seanol-P. The Seanol-F products are generally targeted at the treatment of fibromyalgia. Nutricology Fibroboost® for example, provides 400 mg of Seanol-F per capsule (a total of 1,200 mg per the recommended 3-capsule serving) with each capsule costing around 70 cents ($2.10 per daily serving). The bottom line: Marine-D3 appears to be a clinically untested formulation and there is no evidence that it is effective as an "anti-aging" product. Its individual ingredients may offer selected benefits to specific individuals but buying this product means paying a large premium to get vitamin D, omega-3 fatty acids, and a relatively new ingredient for which there is only preliminary and limited evidence of potential benefit. Could Consumer Labs please conduct a product band comparison analysis of Ecklonia cava products? There is a wide variation in prices and they all seem to claim highest purity and sourcing from only the best place in the oceans (which is pretty much one place in the world). As someone who regularly consumes Ecklonia cava to reduce systemic inflammation, this would be very very helpful. Hi Kevin - Thank you for your suggestion, we will keep this in mind. The Nutricology product delivers 1200 mg in 3 capsules, not 1. Thanks Harold - We've updated the information about FibroBoost above. This CL Answer initially posted on 1/5/2013. Last updated 9/14/2018.